He invited readers to send him emails at [email protected]. I loved his book , so I did write to him and I requested to meet him and he accepted! Four hours quickly zipped by as I interviewed him and we chatted about the Internet ( I take pride in calling myself an Internet Pioneer ) and financial literacy. After that I became a certified Dr. Larry Gamboa fan, and he became my favourite Superhero of Abundance (oops, of course, I meant next to Bo Sanchez). Who is Dr. Larry Gamboa? Dr. Larry is a Doctor of Business administration from the University of Michigan, who found learning accounting dull and difficult. The fact that he was such a poor student of the subject (even as an undergraduate in De La Salle College and even when he won a Fulbright Grant to study in the United States) caused no noticeable damage until he went into business for himself. He joint ventured with Washington Sycip of SGV and William C. Byham of Development Dimensions to launch SGV-DDI. Dr. Larry thinks there must be thousands of guys just like him who need to get a positive working understanding of accounting, finance and taxes, but who are not likely to do so from a standard textbook classroom approach. He has put together three businesses in his lifetime (managing two) and still aiming to take one public. He has made and lost just about enough money to have the requisite humility and pride to write his fourth book, Scale Up Your Internet Startup. Although a bookworm and a teacher by heart, the books he writes like Think Rich, Pinoy! and Grow Rich, Pinoy! are not like your boring academic books. They were written for men and women interested in business and who need to understand how accounting and creating can benefit them – personally, corporately, spiritually. 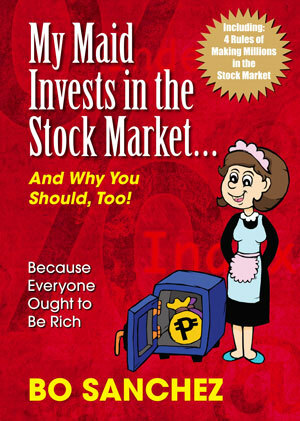 In his first book Think Rich, Pinoy! Dr. Larry shares the deals (focusing on real estate foreclosed properties) and the benefits (travel and seminars abroad with family, etc.) of what financial literacy has done for him and family and me. He professes his goal to excite everybody, enough to sense what financial literacy can do when used to make investments that are both profitable and fun. Dr. Larry writes to learn and to share what he is learning. Writing about his deals makes him not only richer and richer, but gives him the pleasure to learn even more and to share even more — which is where real wealth comes from. After all, isn’t money just an idea? Dr. Larry finds that ideas executed and shared simply, become the raw materials from which true wealth comes. Fundamentally, that’s what entrepreneurs are — creators. 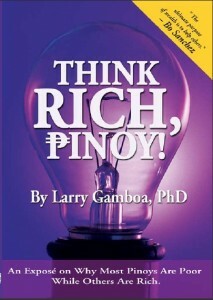 The past 6 years, Dr. Larry Gamboa sold more than 40,000 Think Rich Pinoy Books, ran 24 One-Day Think Rich Pinoy Wealth Seminars reaching out to more than 1680 people nationwide and to more than 10,000 global Pinoys through the Think Rich Pinoy Membership site, E-mails and Videos. Dr. Larry’s Dream is to grow a Movement to help create 10,000 Entrepreneurs by 2023. Pingback: The Think Rich, Pinoy! Phenomenon | Join The Truly Rich Club!